Today I'll take a small pink bear, a flappin' bat, a lumberjack, and a dinosaur out to beg candy from the neighbors. I'll sneak candy from their bags for "inspection purposes". We'll probably all have tummy aches. In short, we'll have fun. Just a few random thoughts at the end of a busy week. I love this idea of Julie's...for anyone wanting to have a handmade holiday but aren't sure where to start or just need a little motivation, this just might be the ticket. Knowing Julie, it will be amazing. This guy and his talented feet kind of blew me away. I can barely walk with mine, and he's making chess pieces with his. I miss the days when kids could bring homemade treats to school. Where are the sticky popcorn balls and pretty homemade cupcakes? Can we get back there please? This article comes off as a little "you kids get off my lawn" but I enjoyed it anyway. I can't decide what I want to add more to my ultimate christmas list, a foraging trip with Steve Brill, a new workshop, or a nap. I've had four kids, so how did I forget how difficult the 2 year to 3 year old transition is? Shouldn't I be way more relaxed about it by now? I've been (finally) playing with the clay that I slaked from the yard. There are 57 days until christmas. I'll be having a small shop update today. These textural stones, and others, will be available for purchase at noon cst in my shop. The stones are viewable now if you'd like to have a look, and will go live at noon. Next week there will be a brooch or two in the shop and maybe a few other things, if all goes as planned. I'm hoping to have shop updates more regularly over the next few weeks. If you haven't been able to grab a set of stones or a brooch, but have wanted to, hopefully this will give you more opportunity to do so. Now off to work with me! The book is available both in Lark's Bookstore (which you should check out, there are sooo many great looking books) and on other book sites like Amazon, if you'd like to pick up a copy for yourself. Congratulations Laura! I hope you find some fun projects to work on! I hope you all have a great start to the week. With below-freezing temps headed our way it was time to pluck the last of the green tomatoes from the plants. I assigned the job to the wee ones and it was one they really enjoyed. Especially when they found happy smiling green tomatoes. They picked several pounds of tomatoes and I promised I'd make a pie. Because when life hands you green tomatoes, you make green tomato pie, right? And fried green tomatoes, and piccalilli, and green tomato bread, and and and... They're far too precious a commodity to toss to the chickens, though the little sneaks did manage to grab a couple. The pie was quite good and was well-received. It tasted very much like an apple pie with a consistency that reminded me of rhubarb. A splash of apple cider vinegar lent a nice tartness to it and countered the sweet. I would (and am expected to, like asap) make this again. This is the recipe I used for the pie, and I always use Martha Stewart's instructions for the crust. (though I don't have a food processor so I do that bit by hand). A note about the recipe, even though I used roma tomatoes, which aren't very juicy, I did add extra flour as suggested by the recipe reviews. The filling turned out great, not too runny, just right. Do you have any tips for using up the remains of the summer garden? I found two bottles of dye in my workspace this week that I had forgotten about completely. (you do this too, right?) There was a turquoise blue and a yellow and I really needed some more yellows in my arsenal so I grabbed some wool and did some dyeing. I have just a bit of undyed wool left, but by dyeing over some dyed wool that I had on hand already, and had too much of in some cases, I was able to get a pretty wide spectrum of colors. It was a good way for me to use up the two bottles of dye and to get some mileage from my existing stash o' wool. Some day I hope to use only naturally dyed wool in my work, I think it's part of my path, but I have to admit I love seeing these bright colors hanging on the line. Before I moved to Minnesota, I had only a vague notion of what a chokecherry was and never had I tried one. My husband, who grew up here, talked of having chokecherry jelly and recounted popping the astringent cherries in his mouth as a kid and trying not to pucker. We had been here almost two years before I discovered that our woods held a number of these trees and another year still before I tried my hand at making anything with the cherries. My first batch of jelly wasn't much more than sweet, not what I expected from these notorious little fruits. This year I was able to pick a good amount of cherries before the birds or bugs got to them, and made a chokecherry syrup. To counteract the astrigency of the cherry, it's important to wait until they're black without a trace of red, and to add lots and lots of sugar. Now, I did both but my syrup still had a rather medicinal taste. Not unlike Nyquil, actually. I was a little more successful with my other chokecherry experiment. I look pretty dangerous here, don't I? You may think I'm all sweet mushrooms and soft wool but I have a darker side. And a knife. And mom gym shoes. One of our chokecherry trees had fallen this summer and I finally got around to hauling the wood into the barn for drying. I cut off some of the smaller limbs and thought I'd try dyeing with the bark. I used one of my old kitchen knives to strip the bark (a draw knife is on my list of wants, but what I have are old kitchen knives) from the limbs. I tore the strips of bark into pieces and simmered it in some water for about an hour. The water had taken on an orangey color and the house smelled like earth and cherries, which I didn't mind. I drained the dye and added a piece of unmordanted, scoured silk and wool. The resulting color is a warm tan, sort of like buckskin on the silk and a pale tan on the wool. It's tan, which isn't hard to come by with natural dyeing, but it is quite lovely, a nice shade for autumn. How about you? Have you tried chokecherries? Did you pucker? 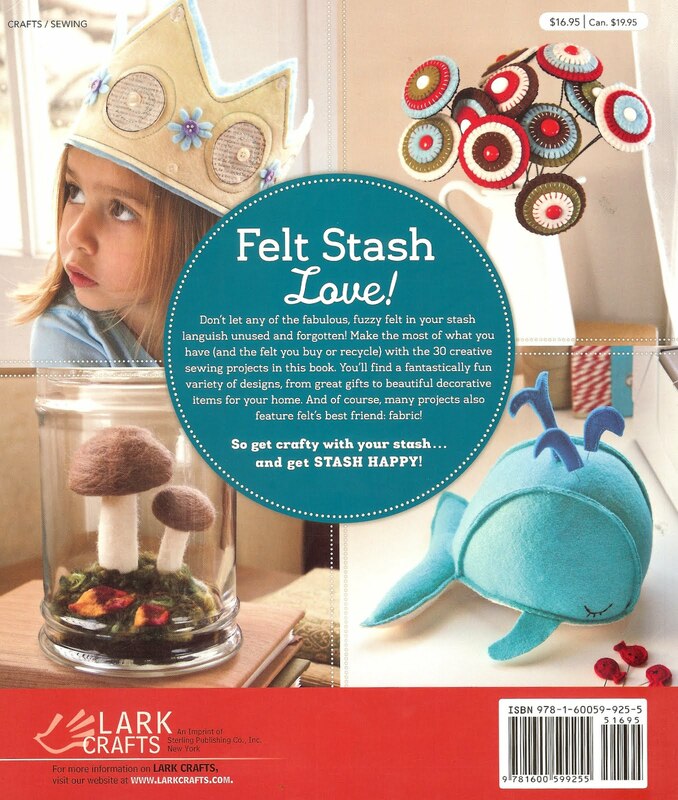 I show how to make a penny rug bouquet and a felted mushroom terrarium using scraps, but there are so many adorable projects in this book! 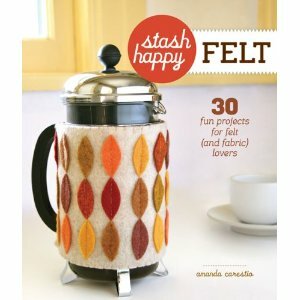 It's really such a delightful book to flip through and many of these projects are on my list to make for the holidays this year. I think you all would enjoy it too, and the kind folks at Lark have given me an extra copy to share! If you'd like a chance to win, just leave me a comment on this post. Tell me what handmade gifts you have in the works, or tell me what kind of craft book you'd like to see written, or just say hello. Please be sure I have some way to contact you, should you win. One entry per person, please. I'll ship worldwide and will announce the winner on Monday, October 24. Last night the setting sun seemed to light the last remaining leaves on fire. Faded green and tan leaves were suddenly golden orange. It was beautiful. I snuck a walk out in the woods this weekend, amongst the blowing leaves and chill of late autumn. The change in seasons here seems so abrupt, and the colorful and beautiful days of fall seem especially brief. The few mushrooms I saw, looking like spots of snow against the brown, kept reminding me that winter is coming and I don't feel ready for it. Which was just the reminder I needed to change my vantage point more often. On Wednesday I gave you a glimpse at a piece I had just finished and today I'll show you what those folded layers of edible-looking pink were. You might remember that back in September I had been dyeing wool and silk with lobster mushrooms, well this scarf is what came of that lovely fiber. I nuno-felted that soft merino wool into a layer of silk. The resulting texture is nubby and mottled, and oh-so-interesting. It's soft enough to be worn next to the skin. The color varies and runs from mauve to fuschia. In the spots where the silk bubbles up through the wool, you'll see a pale ballerina pink. This is a shorter scarf but because it has some give, it can be tied once around the neck. I've made a wool pebble brooch as a closure for it as well which allows the wearer to tie it in different ways. I used all of my lobster mushroom-dyed fiber on this piece so there will be no others like it. It amazes me what is possible with natural materials. Granted, doing work this way is far more labor-intensive than grabbing a box of Rit and some polyester, but the results are so rewarding for me. I have a piece that is unique and easy on the earth, but I also got to have the experience, the learning experience, from making it. This is why I do what I do, and oh how I love it. This scarf will be in my shop shortly and I'd be grateful if you'd check it out, or share it with someone who might like it (any pink-loving mycologist/nature lovers out there? ), because I'd love to be able to continue to do what I do. There were several growing on a highly decayed oak log so I pried a few off and took them home to identify them and see if I could dye with them. Charlie saw it in my hand and gave me a "say what?" look. I had to reassure him that it was just a fungus and not an actual dog nose. That would just be wrong. It had a very woody feel to it and while the top was a shiny black, the sides had a hint of very dark green in them. I was eager to see if I could coax any color from it but since I didn't have time to dye with it right away I popped it in the freezer inside a resealable bag. I recently pulled it out and made dye with it by chopping it into bits and simmering it in water. It quickly began turning the water into a brownish color so I was hopeful. I mordanted two strands of wool yarn, one in alum and one in ammonia, and left a third without mordant. I was surprised to see that the yarns picked up a green color from the dye, since the dye itself looked brown, and that the unmordanted yarn held the color the best. I put my unmordanted merino wool in the dye bath and simmered it for about an hour. It came out an olive green, more green than what this image is showing, and I couldn't have been more excited. I did a second batch in the same dye and only came up with a tiny bit of color. I did notice with this that the color really developed with heat. The yarn that touched the bottom of the pot was more green than the middle, and the same was true with the roving. I have another mushroom in the deep-freeze that I'm eager to try out, and I'm crossing my fingers it's as exciting as this one was for me. Have you had any happy experiments lately?